Vidur Neeti is a chapter in the Udyoga Parva of Mahabharata and it contains the advice given by Vidura to the blind king Dhritarashtra. The advice is now known as teachings of Vidura. 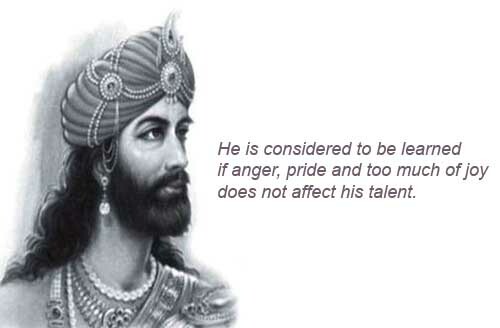 This collection of quotes from Vidur Neeti mostly from translation of Mahabharata. A man who lusts after the wife of another cannot sleep. A man who has lost all his wealth cannot sleep, or one who thinks all his wealth will be lost. A person afflicted with avarice, greed and jealousy cannot sleep. An unsuccessful man cannot sleep. A weak man oppressed by as strong man cannot sleep. A conscientious and intelligent person engages in ventures which are within his personal capacity physically and mentally. Neither does he aspire for ventures which are beyond his capacity nor does he consider any as of low order or beneath his dignity. The person who does not go around advertising his talent and achievement is to be classed as learned. He is considered to be learned if anger, pride and too much of joy does not affect his talent. The truly learned does not open his lips about another’s affair without being specifically asked about it. Who never loses himself in utter joy on the praise and affection bestowed upon him by others, does not get immersed in sorrow due to undue defamation by others; remains unmoved by either praise or defamation by other is to be taken as learned. He that is learned, examining everything carefully and reflecting well, should, from a distance, avoid the friendship of vile and wicked-minded persons. Excess of pride, excess in speech, excess in eating, anger, the desire of enjoyment and intestine dissensions, O King, are the six sharp swords that cut off the period of life allotted to creatures. It is these which kill men, and not death. Knowing this, blessed be you! He that accepts the teaching of the wise, he that is acquainted with the rules of morality, he that is liberal, he that eats having first dedicated the food to the gods and the Pitris, he that envies none, he that is incapable of doing anything that injures others, he that is grateful, truthful, humble and learned succeeds in attaining to heaven.